Crown Las Vegas, adjacent to Fontainebleau Las Vegas resort, would have been a joint venture between LVTI LLC and Crown. Crown, Australia’s biggest casino owner, has a 37.5 percent of LVTI and a 20 percent stake in Fontainebleau. LVTI will stop making payments for the property and loose their $44 million in real estate investment. Their option to purchase the property has concluded. The venture with IDM and York held the right to buy the property for $475 million and planned to borrow to fund construction. The location of the 27 acres is at the south east corner of the Las Vegas Strip and Sahara. The north east corner was the site of the previously proposed Ivana Las Vegas. Both of these had very lofty goals and heights. They tried to get their project passed by the FAA, but failed to with their original architecture. Crown has been busy investing in Las Vegas. They’ve invested $1.75 billion in cash for Cannery Casino Resorts LLC, for three casinos in Las Vegas, Nevada and a Pittsburgh racetrack. 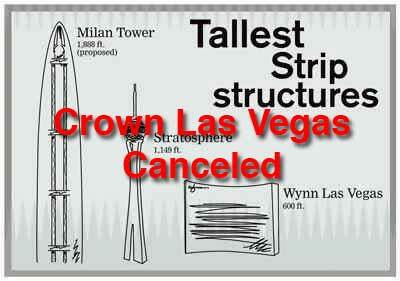 Crown Las Vegas $44 million hotel casino resort has been canceled.